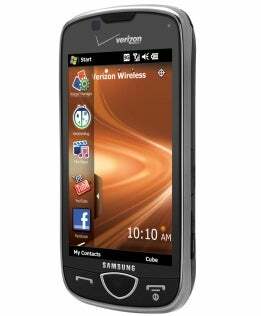 On the surface, the Samsung Omnia II ($200 with a two-year contract from Verizon; price as of 12/1/09) seems to be the Windows Mobile phone that fans have been waiting for. With its gorgeous 3.7-inch AMOLED touch display, attractive design, and impressive specs, this phone is a real head-turner. Unfortunately, the Omnia II's performance disappoints. The TouchWiz 2.0 user interface seems to bog down the phone's speed; in one instance, our review unit crashed and had to be restarted. On looks alone, the Omnia II is quite alluring and fits in nicely with Verizon's line of premium smartphones like the Motorola Droid, the HTC Droid Eris, and the BlackBerry Storm II. Measuring 4.7 by 2.4 by 0.5 inches thick and weighing 4.8 ounces, the Omnia II is just slightly larger and heavier than the original (which was 4.4 by 2.2 by 0.5 inches and weighed 4.3 ounces). Still, the phone remains quite slim. With its rounded corners, brushed metal details, and smooth red-and-black back cover it is much more aesthetically pleasing than its predecessor. The 3.7-inch WVGA AMOLED display dominates its face with a piano-black border surrounding it. Hardware keys on the face are minimal: Talk and End/Power keys flank a large Main Menu key that looks deceptively like an optical mouse (which the first Omnia had). The left spine houses the 3.5mm headphone jack (a welcome upgrade--the original lacked one), an easy-to-press volume rocker, a microSD card slot, and the OK key (pressing it once closes an app; holding it down returns you to the home screen). On the right spine is the stylus (at the top), a USB port, a lock key (for locking the screen), and the camera/camcorder key. The Omnia II has 8GB of built-in internal memory and 16GB of expandable memory with a microSD card (sold separately). Call quality was consistently good over Verizon's 3G network, though I did notice a faint hiss on one call. The vast majority of my calls sounded loud and clear with very little background noise or distortion. The Omnia II has no physical QWERTY keyboard, so you'll have to rely on its touchscreen keyboard. This keyboard is a bit cramped in portrait mode, but gives you plenty of room to type in landscape mode. Unfortunately, I encountered a few issues when using it. First, the spacebar is small, and oddly placed on the right side rather than at the bottom center, where you'd expect it. Second, the delay between what I typed and what appeared on screen was distracting. Finally, haptic touch (light, vibrating feedback when you press a touch key) is disabled for some reason in keyboard mode. Like the Samsung Behold II (Android-based), the Omnia runs TouchWiz 2.0, a touch-friendly user interface, over Windows Mobile 6.5. You get three home pages that you can customize with widgets and shortcuts to your favorite apps. To add a widget, you simply press the pull-out Widget Tray tab on the left of your screen, and drag one from the list onto your home screen. To remove a widget, you press down on it, and drag it back to the Widget Tray. You can also manage your widgets via the Widget Manager. And you can get more widgets for free via the Widget Store. While it is nice to have some customization options, arranging widgets on your various home screens can be a tedious process; the screen simply isn't all that responsive. You have to press down pretty hard to move a widget, but sometimes that causes the widget to open--which is quite annoying. Along the bottom of every home screen are shortcuts to your text messages, your e-mail, the dialer, and your contacts. At the top of the screen is the familiar Windows Mobile Start menu. But instead of the drop-down menu we're used to, pressing Start takes you to four Main Menus loaded with shortcuts to various applications and settings. Here's where things get confusing: The interface also has an entirely separate menu for multimedia applications, called the Cube Navigation Menu. So that's four main menus, one widget menu, the Cube menu, and your three home screens--all with overlapping content. Unfortunately, in one of my hands-on tests I experienced a crash. I tried to close the messaging application after sending a text, but nothing happened. I tried to close it again, but got a screen that was halfway between my Main Menu screen and my home screen. I left the phone idle; it went into lock mode. I unlocked it and again tried returning to my home screen, but nothing happened. After some time, the phone went to my contacts screen. I tried closing out of that, but the phone froze and went into lock mode again. I eventually had to shut down and restart the phone to get it to work properly. The Omnia II ships with two browsers: the new Internet Explorer Mobile and Opera Mobile 9.7. To zoom into a page on Internet Explorer Mobile, you tap twice on the area that you want to enlarge. Scrolling through pages on Internet Explorer Mobile isn't as smooth as the iPhone's Safari, but browsing is adequate overall. The Opera 9.7 system of displaying open pages isn't ideal (it shrinks them to thumbnails and tiles them side by side), but it does load pages quicker than IE. For music playback, you get two interface choices: the standard Windows Media Player and the more aesthetically pleasing TouchWiz player. With the latter, your library is displayed as touch-friendly "cards," which you can flip through to find what you want--sort of imitating the feeling of flipping through physical albums. If you want to tweak the audio, however, you'll have to do it from Windows Media Player. You can jump from the TouchWiz player to WMP by pressing "Library" in the lower left corner. But as far as I could tell, you can't go from WMP to the TouchWiz player. The phone doesn't come bundled with headphones, so you'll have to use your own. Music piped through my high-quality Skullcandy FMJ headphones sounded very good, though a bit flat from the external speakers. The Omnia II comes with an FM antenna/mic adapter that you can plug your headphones into, so if you get bored with your collection, you can see what's on the radio. You can also buy music via Rhapsody through V Cast Music on the Omnia II. Video quality, as to be expected, looked great on the Omnia II's large AMOLED display. One of the best things about AMOLED is its wide viewing angle. You can place the Omnia II on a flat surface and watch video without any distortion or color change. Colors were bright and accurate, motions were smooth, and I saw only a bit of blurriness in some clips. Camera quality, for the most part, was quite good. Colors looked bright and accurate both indoors and out. The camera also managed to capture detail quite well, handling some close-up shots of action figures without any blurring or pixelation. One design flaw: The shutter button's placement on the top right edge mirrors the OK button on the phone's bottom right edge. When you're gripping the phone, you may accidentally hit the OK button and close the camera app midshot. The Omnia II is an excellent upgrade from the original Omnia and definitely one of the best Windows Mobile phones available. The crash I experienced was disturbing, however, even though it happened only once. I was also disappointed with both the phone's sluggishness and the unresponsiveness of the touchscreen--issues we had with the previous version, as well. Most Verizon customers will probably pick the Motorola Droid over the Omnia II, but Windows Mobile loyalists will find a lot to like about this multimedia powerhouse. With its eye-catching design and variety of multimedia features, the Omnia II is a solid Windows phone, but sluggish performance keeps it from being perfect.